"I am not a vegan or vegetarian but still really enjoy this recipe. It is similar to one I found on a vegetarian website, however, I made my own additions and now it is amazing! These are an awesome side dish or main dish! They can be served with Parmesan cheese, red or green hot sauce, or olive tapenade, but these are also great by themselves!" Heat 2 tablespoons olive oil in a skillet over medium heat; cook and stir onion and garlic until onion is softened, about 5 minutes. Add spinach to onion mixture; cook and stir until wilted, about 5 minutes. Transfer onion-spinach mixture to a large bowl and cool slightly, 5 to 10 minutes. 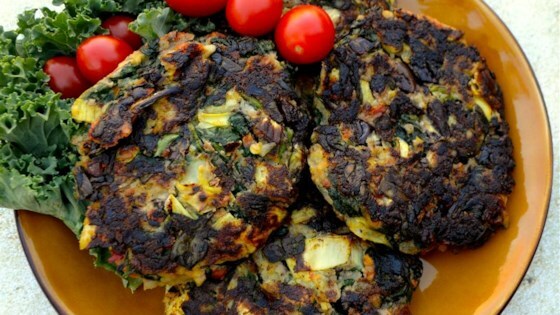 Mix parsnip, artichoke hearts, olives, almond flour, tomatoes, eggs, walnuts, salt, and pepper into onion-spinach mixture; form into 6 cakes. Heat remaining 2 tablespoons olive oil in a skillet. Cook cakes in the hot oil until browned and crispy, about 5 minutes per side. See how to make a roasted eggplant and portobello mushroom sandwich. If mixture will not form into cakes, drop by large spoonfuls into the skillet.